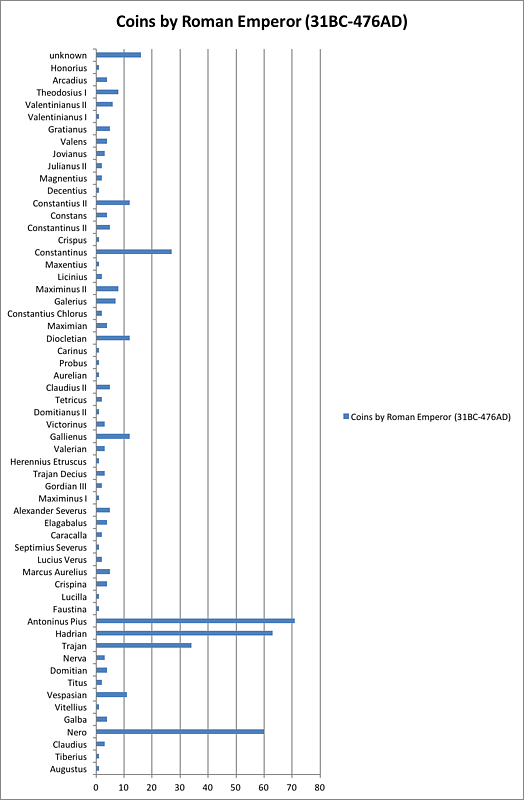 The Luther College Ancient Numismatics Collection is curated by the Department of Classics. It consists of 758 coins ranging in date from the Greek Archaic period to the Byzantine era. All of them were collected by three Luther professors, who then donated their collections to the college to be used for teaching purposes. Orlando (Pip) W. Qualley (1897-1988) was a member of the Luther College class of 1918, and in 1931 he received a Ph.D. in Classics from the University of Michigan. From graduation until his retirement in 1969 he held a variety of positions at Luther, including vice president, dean, professor of classical languages, registrar, basketball coach and football coach. While participating in an archaeological dig in Karanis, Egypt between 1924 and 1925, Qualley obtained the 420 coins in his collection from Dr. David Askren. Askren was a medical missionary living in Cairo and had a keen interest for antiquities. The coins that Qualley procured were originally offered to Prof. Kelsey, who was the leader of the archaeological expedition in Karanis and to whom Dr. Askren had sold numerous antiquities before, many of which still reside in the Kelsey Museum of Archaeology at the University of Michigan. After Kelsey declined to buy the coins, either because he had acquired so many in other excavations or he realized that the Karanis excavations would yield many more (over 50,000), Dr. Askren offered them to Qualley, who then purchased them. Most of the coins from this collection range from the 4th century B.C. to the 4th cent. A.D. His collection was given to Luther in 1925. Richard Simon Hanson, professor emeritus at Luther, donated his collection of ancient coins to the college. He obtained many of them while undertaking doctoral research on the Dead Sea Scrolls in the Upper Galilee. He spent nine summers doing archaeological work with the coins, including cleaning, photographing, and studying them. The coins with which he worked numbered around 6,000, but those were the property of Israel. Israeli officials allowed Hanson to procure the coins that they did not want, and Hanson ended up with around 600 coins, many of which eventually became part of Luther's collection. Hanson has written several books regarding the coins, many of which deal with the coins unearthed at Khirbet Shema, an expedition on which he was the numismatist. 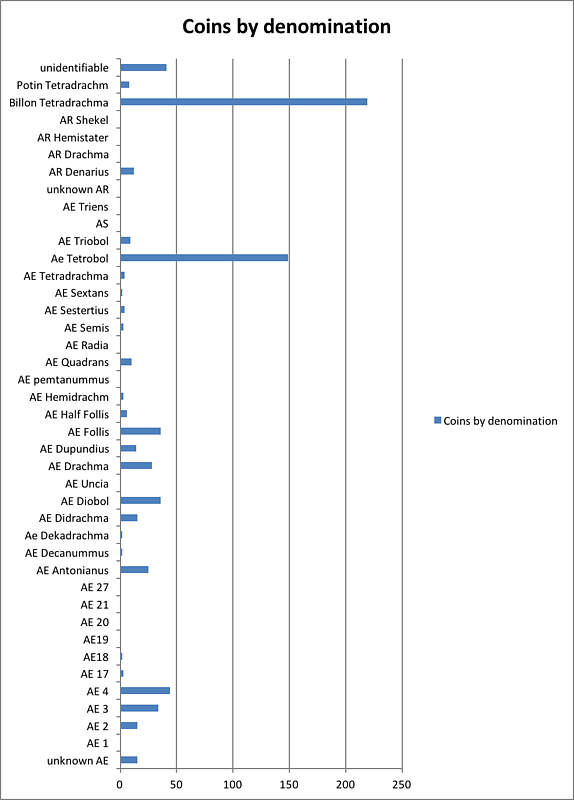 In fact, much of what we know about the coins in the Qualley and Haatvedt Collections are the result of Dr. Hanson's efforts to catalog and describe them. After graduating from Luther in 1930 and going on to obtain a graduate degree, Rolfe Haatvedt returned to Decorah and was a professor of classics at the college for 37 years. 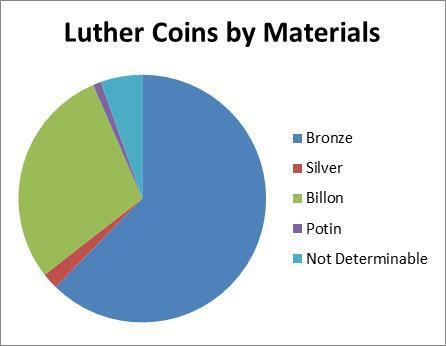 Over the course of his career he built up a private coin collection, which was donated to Luther College by his wife Helen after his passing. The ancient Greek world was split into nearly a thousand self-governed city-states, or poleis. The larger ones minted their own denominations of money starting as early as ca. 700 B.C. As coins spread, the weights of the coins became more standardized. However, each city was responsible for their own minting, so standards of weight and worth were never wholly uniform as they were with the later Romans. Each city had unique symbols which could be used to identify the city of origin; Athens, for example, was represented by an owl, an animal commonly associated with their patron goddess Athena, while Rhodes was represented by a rose—a play on words since the Greek word for rose was rhodon. Greek coins are separated into three periods: the Archaic period (ca. 700-480 B.C. ), the Classical period (480-323 B.C. ), and the Hellenistic period (323-31 B.C.). The Archaic period is defined by the emerging city-states of ancient Greece, from the introduction of Greek coinage in around 700 B.C. until the wars with Persia in 480 B.C. At this time, there were no Greek empires. Instead, city-states entered into loose alliances (or ‘leagues’) with neighbors for mutual interest and protection. The Classical period is defined as the period from 480 B.C. (when Greece repelled the Persian invaders) until the death of Alexander the Great in 323 B.C. During the Classical period, some city-states became much grander, with larger spheres of influence. Their coins commonly featured a god or goddess on one side, usually the patron god from the city of origin, and a symbol of the city on the other. This was also the period when inscriptions began appearing on coins, often explicitly stating the city where it was minted. The Hellenistic era, which stretches from 323 B.C. to the death of Cleopatra in 31 B.C., is commonly referred to as the age of Alexander the Great and his successors. In this era, Greek coinage spread all over the Mediterranean and Middle East as far as central Asia. Greek coins became common over vast distances, reaching areas as far east as Sri Lanka and Indochina, and as far north and west as Great Britain. These coins set the standard for centuries to come. After Alexander’s death, many of his successors minted coins with their own likenesses and names on them. Because these successor kingdoms were much larger and wealthier than the Greek city-states of the Classical period, their coins tended to be larger (and frequently in gold) and mass-produced in larger numbers. In places isolated from the Mediterranean, such as Afghanistan and India, these coins are some of the only evidence of certain Greek occupation and influence. According to Roman tradition, the city of Rome was founded in 753 B.C. Starting out as an inconspicuous riverside village under the rule of local kings, the Romans overthrew their monarchy in 509 B.C. and established the Roman Republic. Over the years the Republic spread its domain westward (into modern France and Spain), southward (into Tunisia and beyond), and eastward into Asia Minor (modern Turkey). In 27 B.C., the Republic was transformed into an Empire, with Augustus reigning as the sole ruler of Rome and its provinces. He and his successors spread Roman rule to Judea, Egypt, Britain, and for a brief time Armenia and Mesopotamia (Iraq). This Empire survived in one form or another until the fall of the Byzantines in A.D. 1453. During most of this time, coins were minted for the government’s use, often to pay debts or soldiers’ salaries. Accordingly the government usually minted gold and silver coins, as paying large amounts with bronze would have required too many coins. Thus, bronze coins were minted at irregular intervals, and their quality was often lacking. However, a lesser quality coin was required for everyday purchases by the populace, and thus these coins are the most common found. During the later empire, local authorities could mint bronze coins, but silver and gold coins were still minted only under the authority of the emperor. Because everyone within the Roman Empire had need for money, coins were universal. However, for the minters they often served other purposes besides just monetary transactions. For instance, much Republic coinage featured images of the bust of Roma, a female deity who personified the city of Rome. This changed when Julius Caesar, after seizing control of the mint from the Senate, became the first to mint an image of a living person—in this case, himself—on a Roman coin. Following Caesar’s assassination in 44 B.C., the practice of putting one’s portrait on a coin was not abandoned. Subsequent emperors made it a tradition. These portraits were an important means of spreading the emperor’s image throughout his domain, and they often tried to make the emperor seem divine. Often the coin would embody attributes of the individual portrayed on it. In addition to their own portraits, emperors would sometimes mint coins with images of past emperors as homage to them. Other times they would mint coins adorned with images of their designated successors in order to establish and solidify their rightful heir. The imperial coinage was, fundamentally, a government-controlled economic instrument which also had added value as propaganda. When the Jewish Hasmoneans, commonly known as the Maccabees, revolted and gained independence from the Seleucids in 140 B.C., they began to mint the first truly Jewish coins. These coins continued to be produced under the Herodian dynasty, a puppet government for Rome, and later under the Romans themselves. During the Roman rule of the Levant, many coins were minted under the authority of territorial governors, including Pontius Pilate of New Testament notoriety. Jewish coins were produced again for short periods during the Jewish Revolts of 66-70 and 132-135 A.D. Although these coins are not as technically impressive as their Greek or Roman counterparts, they are nonetheless important to historians. 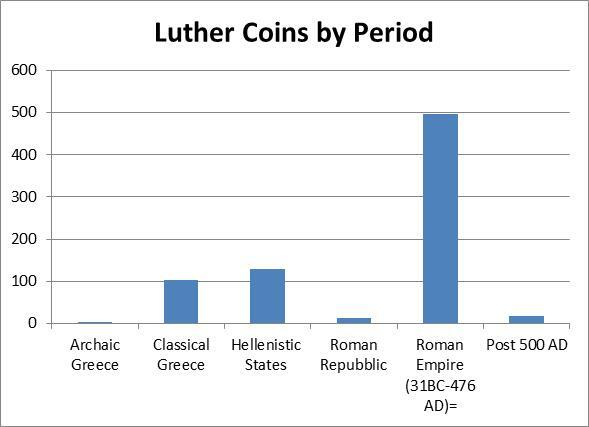 Many of Luther’s coins from the Levant were donated by Richard Simon Hanson, professor emeritus of religion. Hanson obtained his coins while working as a numismatist between 1970 and 1972 for an archaeological expedition at Khirbet Shema in modern-day Israel. Many of the coins are rough, as the finer examples were taken by the archaeologists or put into museums in Israel, but there are also a few replicas to give a better sense as to what the coins may have looked like in their original condition. 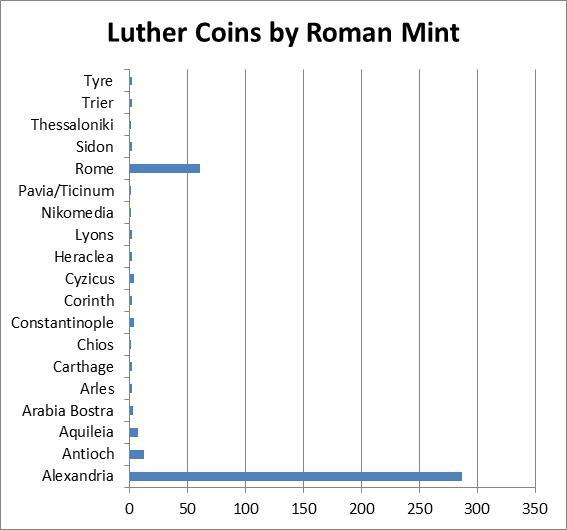 The Levantine coins in the Luther collection are mostly of Jewish origin, although a few Seleucid and Ptolemaic coins do appear.